Many stories have been written about the naval battles of World War II. Usually, they involve the expolits of destroyers, cruisers, air craft carriers and submarines. If John F. Kennedy had not run for President of the United States, I doubt many people would be aware of the smaller craft that played such an important part in history. However, boats like the PT-109 were not the only small ships to brave the treacherous seas of the Pacific Ocean...and my father spent five years on one of them--a submarine chaser. In August of 1940, when WWII was on the horizon, my father, Frank J. Donovan, enlisted in the U.S. Navy (Boston, MA). After his training in Newport, RI, he was assigned to the SC-982, a 110-foot wooden boat used as a submarine chaser in the South Pacific. For several years, Frank stayed on the boat, even though the rest of the crew changed often. And, he said, he was seasick every day of those years. As a child, I would listen with rapt attention as my father would recount tales of his life aboard the SC-982. I heard about the stops in Bora Bora and Pago Pago; how he met up with school chums while on leave in Australia for a little "horseback riding" and his experiences with wartime Aussie steaks..about crossing the International Dateline and the Equator and the "Ancient Order of the Deep". But I also heard about the times when the ship encountered the enemy--how the Captain had requisitioned two extra guns which were secured with straps to the wooden deck. Being added equipment, the "stops" which were usually required for the safety of the crew couldn't be installed. Their absence meant that anyone firing the guns could swing the barrel 360 degrees--right over his own men's positions! On one occasion when the boat was under fire, the First Officer and my father were stationed at those guns. When the Japanese planes soared overhead, the First Officer swung the barrel of his gun over the sailor's heads. When my father saw him do that, he was enraged...and trained his own weapon on the First Officer. He shouted at him that if he ever did that again, he'd blow him off the deck! When the altercation was over, the First Officer went to the Captain and complained about my father's action and demanded he be court martialled. Fortunately, the Captain of the SC-982 was a real sailor and understood the danger his men had been in when the First Officer fired over their heads. He informed the First Officer that he would do no such thing--that if it had been him in my father's place, he would have done the very same thing! But the dangers for the SC-982 were not limited to engaging the enemy. The sea itself was a force to be reckoned with. Frank was on board the SC-982 when a typhoon came up unexpectedly and keeled the boat over 90 degrees. Miraculously, the ship survived the storm. However, it was overdue in port and the ship was reported lost at sea. Finally arriving at its assigned port of Manila Bay in the Philippines, the SC-982 was challenged, but managed to convince the port authorities of their identity. Once ashore, the crew told their story and pointed out the salt water on their radio antenna. A telegram of commendation was sent to the Captain and crew of the ship for bringing the SC-982 safely to port. The crew of the tiny SC-982 became a close-knit group. For many years, they kept in touch, sending Christmas cards and the occasional letter. These days, there are very few crew members (if any) still alive. But their bravery and endurance will not be forgotten. Frank was honorably discharged October 8, 1945 having served 5 years and 6 days in the U.S. Navy, most of it on board the SC-982. He reinlisted in the Reserves and was again honorably discharged July 21, 1952. The life of the submarine chaser in the U.S. Navy began in 1917 when it became necessary to develop a ship which could locate, keep down, and sink enemy submarines in order to protect military provisioning vessels from being destroyed. After completing a survey of potential boats, it was found that very few would be suitable for conversion, so the United States Navy designed its own ship. In total, 440 of the 447 submarine chasers built were utilized by the United States and its allies during World War I. Their operations were carried out primarily in the Atlantic Ocean and the Mediterranean. Along with destroyers, their job was to counteract the effects of U-boat deployments. After the war, they were used primarily as training vessels at the United States Naval Academy, their numbers had dwindled to just eight by the time of the attack on Pearl Harbor. When a second world war was brewing and Germany was utilizing its submarines to great effect, the need for a new submarine chaser was recognized. A design competition was held and two new designs resulted, while a third adapted the original World War I design for modern use. After testing, the adapted design was chosen for the new submarine chaser prototype. Production of these vessels did not begin until after the United States entered the war. 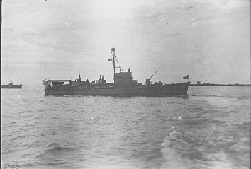 Although U-boats sank many ships along the eastern coast and in the Gulf of Mexico in the early months of the war, the submarine chaser would soon become a deterrant to U-boat activities. Only one sinking of a submarine has been confirmed, however, the submarine chaser's mere presence was effective in curtailing U-boat activities. These new submarine chasers were, like their predecessors, wooden hulled ships. Along wtih their fellow patrol craft, they were light in weight and loaded with the fire power necessary to sink submarines. Aiding in the search for sumbarines were two individual listening devices, part of the weapons system of the SC's. One, called a K-tube, was lowered over the side or trailed astern while the vessel drifted. The second, known as the SC-tube, was attached permanently to the hull for immediate deployment once the ship had stopped. By war's end, 450 SC's had been built, and 37 more were canceled due to a decline in the need for such ship. Under Lend-Lease, close to half of the completed craft were transferred to Allied navies. Others were reconfigured as gunboats and some were used as communications-relay vessels, as well as traffic control during amphibious operations. Length overall 110' 10" 110' 10"
Extreme beam 17' 11.5" 17' 0"
Maximum draft (full load) 6" 6"
2 twin .50's (later replaced with 2 or 3 single 20mm) 1-3", 1-50 cal. mg.
SC-982 Specific information: Built at Vinyard SB Co., Milford Del. ; Keel laid 4/18/1942. Launched 9/7/1942. Commissioned 11/2/1942. Transfered to the Philippines 7/2/1948. My thanks to Bud Shortridge for so graciously sharing his research into the SC-982 and SC's in general. I have summarized here only a portion of the detail that he has provided, but hope that it is enough to convey the value that these valiant little vessels had in the fight against the submarine. I also wish to thank others with an interest in patrol craft who have provided information online.